This is a question we get asked a lot, consumer trends have changed big time since I started out in the fashion industry 15 years ago. Gone are the days where consumers blindly buy fast-fashion or throwaway items with little consideration of the source… who made it, how much were they paid, is it fair trade? The power of Millennials and Generation Z has helped us break the silence on equality, fair trade, and transparency. In the world of crystals, transparency is equally as crucial. So, just so we’re clear, the kinds of crystals we all splash our cash on aren’t in the same league as blood diamonds, precious gemstones and ore mining… far from it in fact. 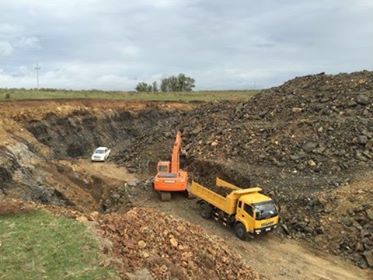 We call it specimen mining, and it generally involves excavating crystals from the rock bed, or collecting loose specimens as by-products from bigger mining projects. Nevertheless, as with any industry, there are still some who don’t always play by the book, and as specimen mining isn’t regulated we need to be even more vigilant to ensure that our crystals haven’t come into contact with any unethical practices such as child labour, dangerous conditions, or heavy duty explosives. Back in 2014 when we were launching SLC, we were lucky enough to be mentored by the inspiring Alex Macintosh at the Centre for Sustainable Fashion at London College of Fashion. Coming from a fast-fashion buying background, this was invaluable experience for me, and his quote has stuck with me throughout the development of SLC and my jewellery line. So that’s precisely what we do with everything we buy. We dream with our eyes wide open. This means we make it our business to ask the right questions and understand where our crystals come from to the best of our ability. Knowing the source in the crystal industry depends largely on trust and reputation. We don’t work with mines that use huge mine-blasting techniques and try to avoid certain routes to market that lack transparency. It’s our aim to pass this transparency onto our customers. Smaller, family owned mines or collectors who’ve spent years building up relationships with trusted mines, are our first point of contact. In the past, I’ve travelled around the world to go to the mines and stone cutters in person, but unfortunately that’s not always financially feasible. Being sustainable is as much about financial responsibilities as it is about social and environmental, so we work towards having a positive impact in all three areas. So, the best way for you to ensure you’re making responsible purchases is to do the same… be careful not to buy imitations and try to buy without too many middlemen from a trusted source. Short of going to the mine itself (which isn’t always that successful when you’re trying to mine yourself…. Look at these photos of one of my attempts at mining… lol!! ), you need to trust instinct and reputation. Try not to buy a stone that comes via a country it didn’t originate from… this is when we lose sight of it’s journey. It sounds obvious but it’s not always that easy. Alongside the loving crystals here at SLC, some of our favourite fellow UK crystal dealers are Crystal Muse and Kacha Stones. As with most industry’s - be it fashion, food, crystals, technology - full transparency involves huge changes – culturally, socially and financially, it’s not something that will happen over night, but we can all take measures to move towards a more transparent world.